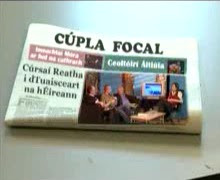 Tá sraith chlár a rinneadh do NvTv, Teilifís Phobail Bhéal Feirste, tá an tsraith seo anois le fáil ar líne. Chuir Chrissie McGlinchey agus Raymie Lawlor na cláir seo le chéile, agus aidhm acu go mbeadh clár Gaeilge ann a dhíríonn isteach ar chúrsaí reatha agus ceisteanna mór le rá an lae anseo sna sé chondae in áit a bheith ró-dhírithe ar an sean-nós agus ar an traidisiúnachas. Iarracht an-mhaith atá ann, agus tá súil agam go mbeidh a thuilleadh le teacht roimh i bhfad. This entry was posted on Dé Máirt, 3 Deireadh an tSamhraidh, 2007 at 17:38 and is filed under An Ghaeilge, Na meáin. You can follow any responses to this entry through the RSS 2.0 feed. You can leave a response, or trackback from your own site.